I have been walking around the pond at my apartment in Palatine for about a year and always wondered what kind of fish can be caught there. I happened to notice some movement on the edge of the pond at times and noticed that there were some pretty good sized fish in there that may be carp. I called DuPage Angler Wacky Bass to come out to investigate with me. Wacky Bass spent the whole day showing me the ropes with carp fishing, and believe me it is much different than I was used to! Wacky Bass explained to me that carp will eat almost anything but he finds that bread and maybe even corn would work the best. We decided to use the bread. We wrapped the bread around the hook, laid the pole in the pole holder and before you knew it the pole started to move! Could not believe how big that thing was and caught him in just a few minutes! I was so excited! Biggest fish I have ever caught! The hardest part of it all was reeling him in without breaking the line! I will never forget that day and that feeling I had! I just love fishing! I think it costed me giving Wacky Bass lunch! I thought that was pretty cheap! 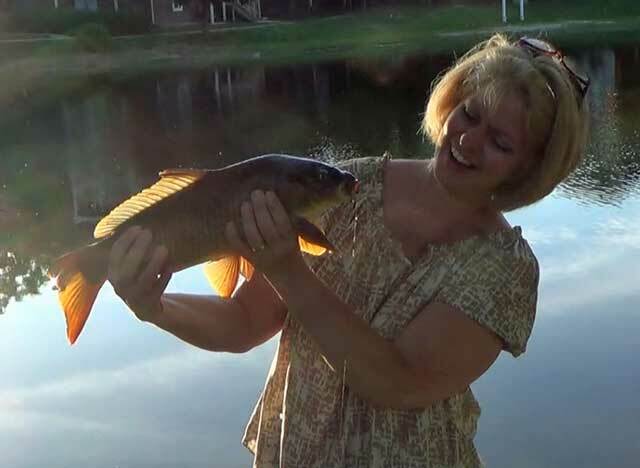 I think I may devote a few evenings during the dog days of summer to trying to catch some carp. They do pull VERY well!! Congrats on the COTD Goofy!! You look very happy! How much did the lessons cost? Maybe I will do it with my family.